India’s colocation and hosting market will generate almost $2 billion in annual revenue by 2019, up from just $1.3 billion in 2016, with most of the growth focused on the metropolitan centers of Mumbai, Chennai, New Delhi and Bangalore. According to the first-ever study of the Indian market by 451 Research, almost a third of all existing white space in the country is located in Mumbai, due to its status as a major financial hub, its population of 21 million and coastal location, in close proximity to submarine cable landing stations. The report predicts solid growth for the Indian public cloud market, expected to increase by a quarter every year through to 2021, reaching $1.02 billion in annual revenue. India is among the world’s fastest-growing economies, with an average annual GDP growth rate of 5.8 percent over the past two decades. It is also the world’s second most populous country, and is on track to overtake China in terms of population around 2022. According to Livemint, the IT industry is the largest private-sector employer in India, and IT services are emerging as one of its most important exports. Such services require data centers to operate – as a result, India is set for rapid expansion of its digital infrastructure footprint. 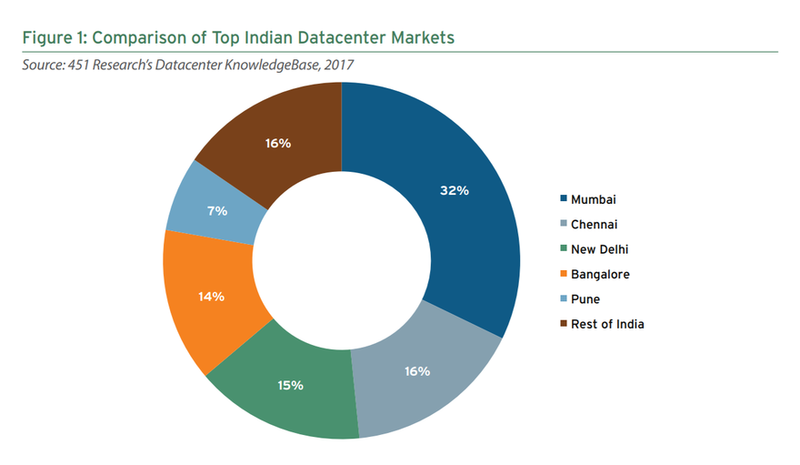 According to 451 Research, 84 percent of the country’s data center supply is currently concentrated across its five largest markets: Mumbai, Chennai, New Delhi, Bangalore and Pune. “Despite these challenges, the opportunity for data center companies to thrive in India is enormous. Most homegrown providers already offer a range of managed services, and many have even launched their own public and private cloud platforms. “The success of local companies such as Netmagic Solutions, NxtGen, Reliance Communications and Sify Technologies has even resulted in partnerships and acquisitions involving global players including ST Telemedia and NTT Communications, and we expect more on the horizon,” Miller added.